Cuisine: Japanese traditional sushi and cooked meals. Price: High (the most famous Japanese chef in Seattle cannot sell his carefully sourced fish of highest quality for pennies). Chef: Master Chef Shiro Kashiba is well-known in Seattle as the father of Japanese cuisine in the city. Sourcing the freshest ingredients, preparing unfussy and authentic Japanese fare in a friendly and simple environment are his signature trademarks. Atmosphere: Unpretentious, lively and simple. In a way this restaurant reminds me Nobu’s “Matsuhisa” in Los Angeles. Simple wooden tables and chairs, japanese art on the walls, long sushi counter with busy chefs dressed all in white and of course the special doing-it-all-for-you japanese toilet. Wear jeans, shirt or anything casual except flip-flops and you will enjoy an unforgettable dinner in a full comfort. Food: Fresh, superb quality fish and seafood, simple preparation. You are in Seattle so get ready for the best salmon you probably have ever had. The fish is so delicate, intense and complex here that I would call it a new species rather than the salmon you get elsewhere. To savour the fish the most just order it as a plain sashimi or sushi (on a bun of rice), so its flavour can reveal itself fully. Starting with Albacore tataki salad, that my local friends frequenting Shiro for many years like the most from the appetizers, I knew that this dinner was going to be something out of this world in terms of dining experience. The Albacore tuna fish was so intense almost meaty in texture, but it was so perfectly balanced that only the most sophisticated palate would recognise it only by eye on a fish market. Served in yummy, melting chunks with a fermented sauce and spring onions, it was simple yet more rewarding than most of the special “new style” melon, kiwi or whatever else with tatakis I have eaten in many fashionable japanese restaurants. 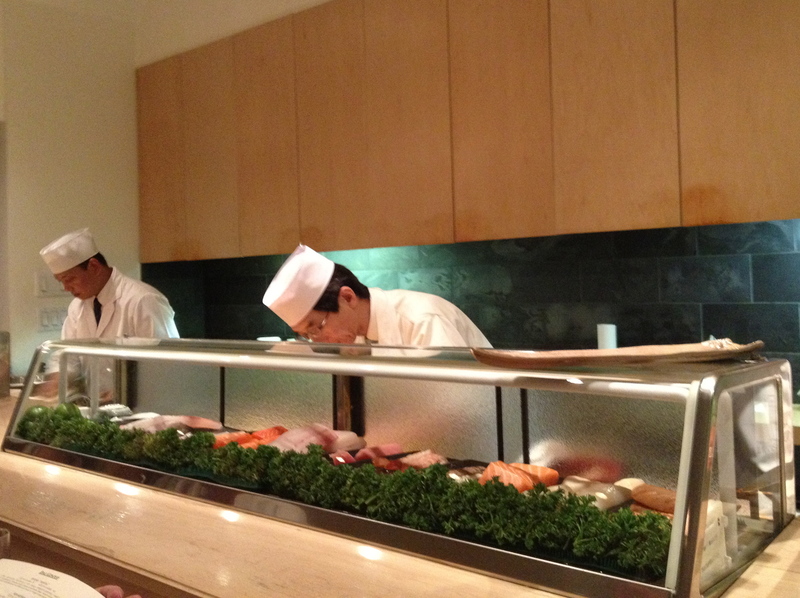 The sushi and sashimi are heavenly fresh and of the highest quality. From the toro, yellowtail, salmon to lesser known fish the chef favours on the market on that certain morning. I rarely like just plain sushi and fancy the omakasa style prepared by a chef in his own original manner, but at Shiro the fish is so perfect and the rice just well-cooked and not too overly cooked and sticky that there is no need for special omakasa sushi here. The rolls are simple as well. 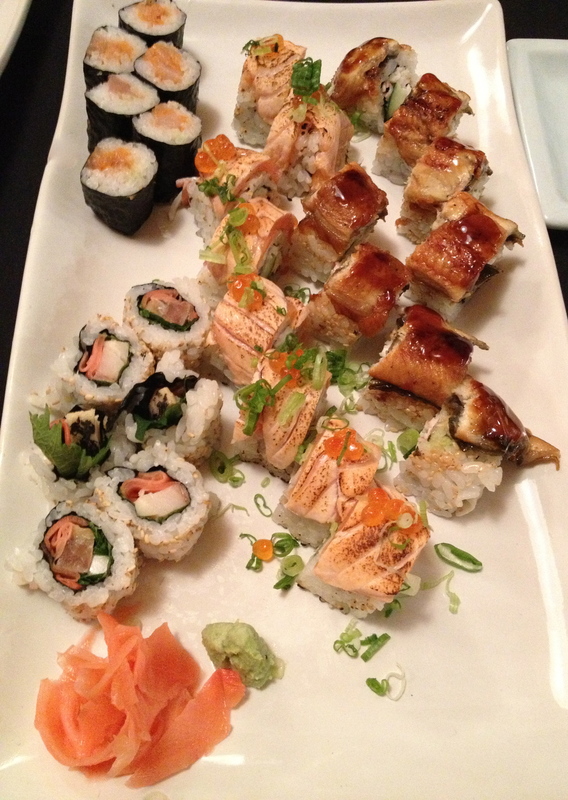 The spicy tuna roll (top left) is out-of-ordinary and the seared salmon (centre) and smoked eel (right) rolls are superb. 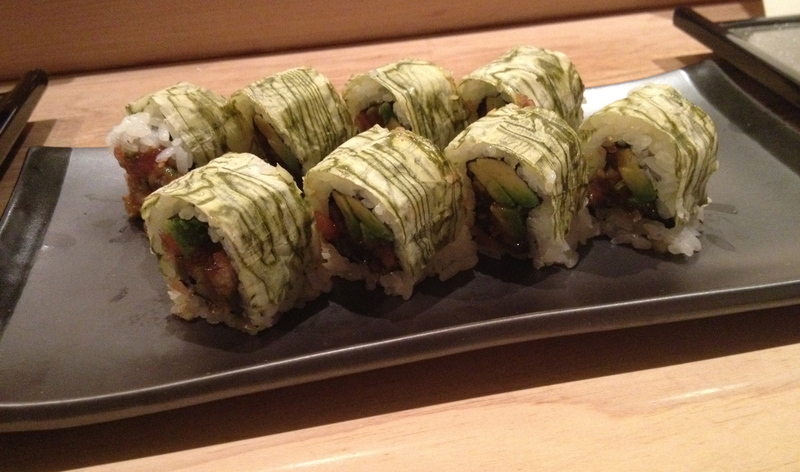 The eal is served with a dense, honey-like sweet sauce atop the california-style roll. 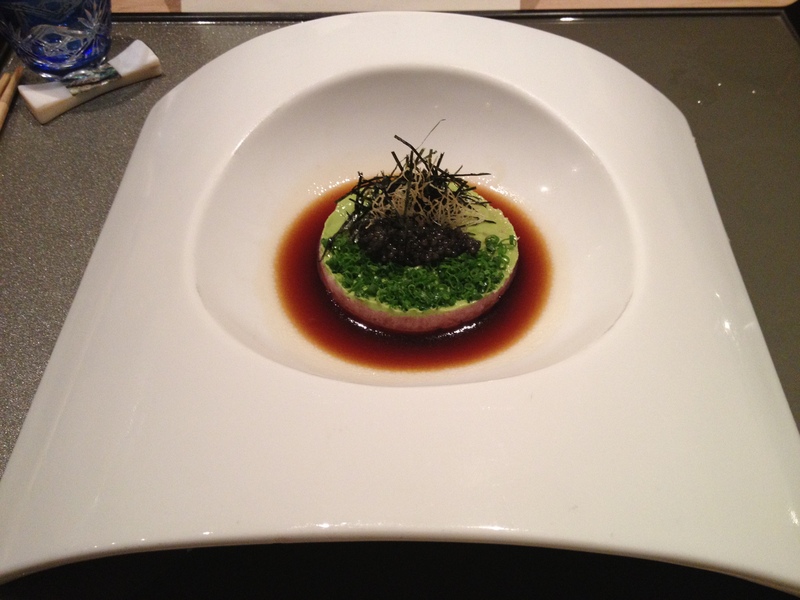 The seared salmon is accompanied with its eggs and chopped zesty green spring onions. Drinks: Beer, sake, japanese green tea and some wine, but not too much choice for wine so I went for tea this time. I have learned this time that with plain and superb quality ingredients in japanese cuisine I can appreciate the flavours better when drinking only green and grassy tea with the food. At more modern restaurants such as Nobu I need the wine to help me metabolize all the complex sauces and heavier dishes. Moreover, the acidity especially in white wine allows me to eat more of these rich dishes. Opening hours: Dinner Mon-Sun: 5:30–10:30pm. 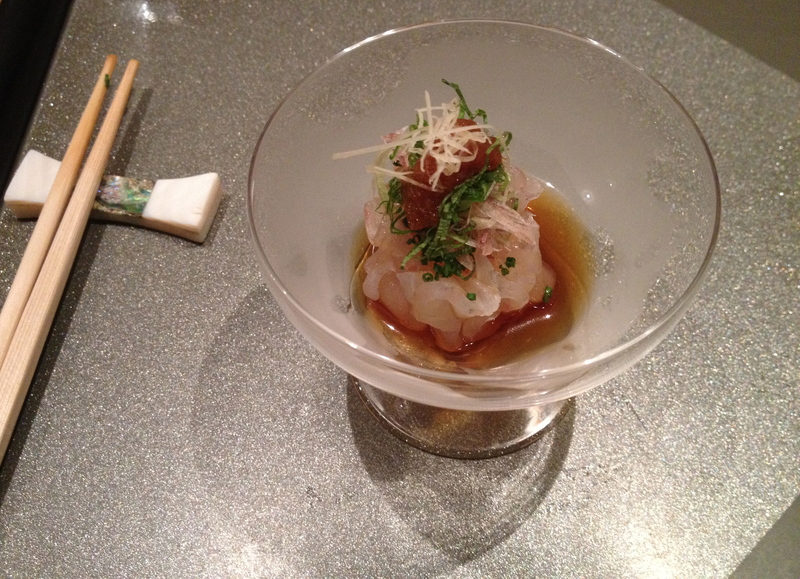 Cuisine: Japanese, chef does omakase sushi tasting. 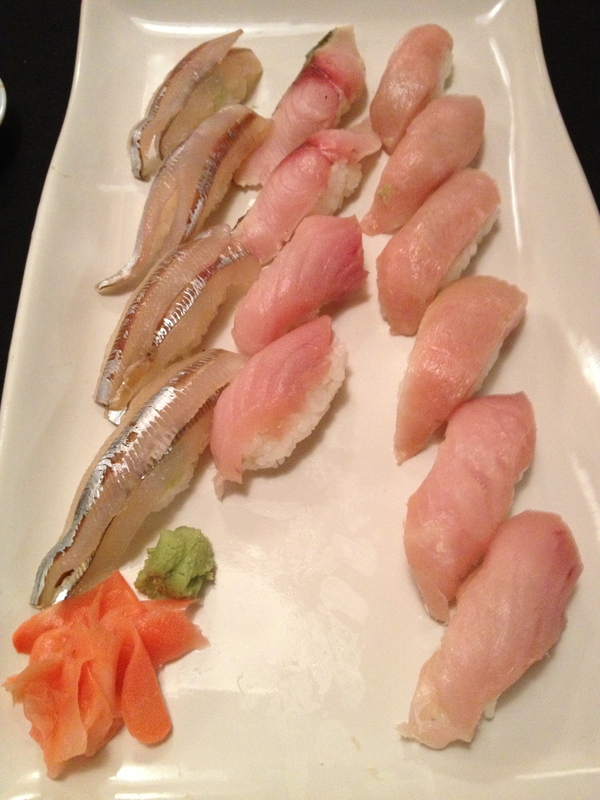 Price: High (all small dishes cost between $10 and $28, omakase nigiri sushi 8 pieces for $46; 12 pieces comes to $62). New York is always on the move and the same is true about its restaurant scene. 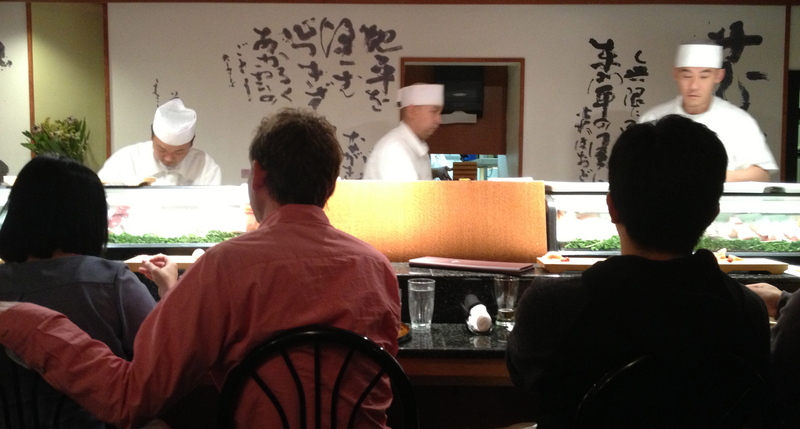 Every time I visit this bustling and vibrant city I find a new and at the same time an excellent japanese restaurant. Soto is my latest exploration. With its simple and discreet entrance and interior you are assured that Soto is not one of the flashy japanese chains where the top city players dine over their business ideas, but a down-the-line gastronomic paradise for japanese food lovers. 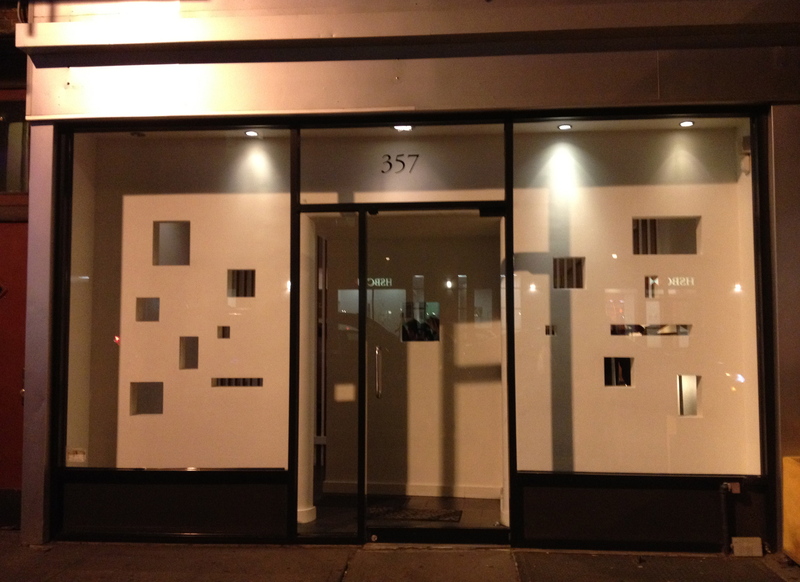 Atmosphere: A neighbourhood dining spot without fussy decoration. The interior is very simple. There is a long wooden sushi bar, tables along the wall and a more secluded ones at the back of the restaurant. There are no private separate rooms available. People dress casually as well as fashionably, so whether you are in jeans or coming straight from work in a suit you will be fine. The service can be sometimes a bit slow and misunderstand your requests, but you can see that they try very hard to meet their guests’ demands. Food: Creative, delicious and modern. Uni rules the menu here. You will find it in many of the tapas-size creations at Soto. Some diners might complain about the size, but I would guess that they might be Americans since in Europe and Asia these portions would be standard at high-end japanese restaurants. Fluke Ponzu at Soto is a great starter. The refreshing thinly sliced fluke fish with chive, shiso leaf, ginger shoots, scallion, under minzore ponzu sauce is served in a cocktail glass and styled to perfection. The fish is fresh and all the accompanying ingredients underline its envigorating properties. With a cup of green tea or sake (warm or cold) the Fluke Ponzu will whet your appetite for the rest of the food. Another party-like dish served in a Martini glass is Uni Cocktail-Murasaki/California. 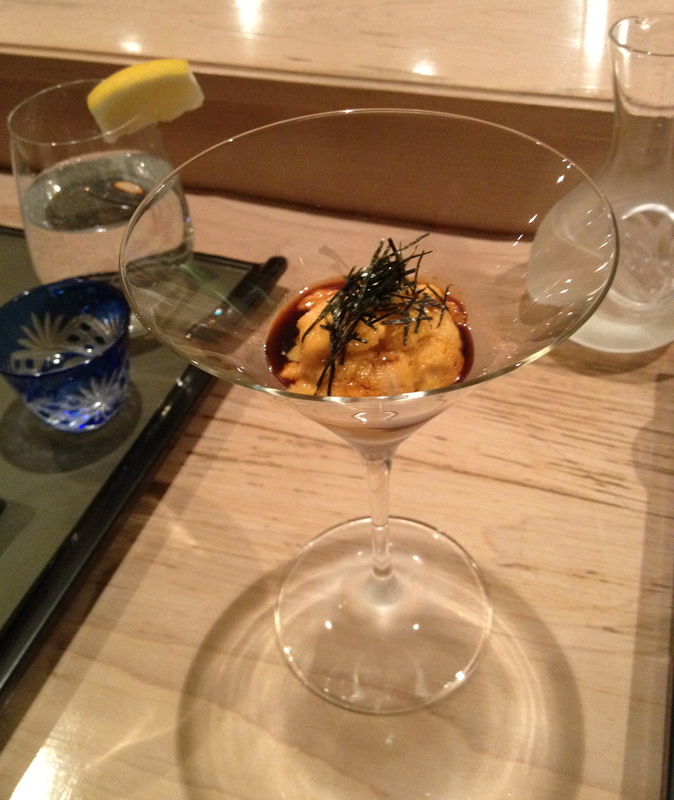 Here the chef’s love-affair with uni (sea urchin) shows in a revealing fashion. The sea urchin sashimi with soy reduction and fresh wasabi is intense as uni always is, but the wasabi calms its powerful taste down with its spicy character and the soy sauce reduces its for some people strange mushi nature. 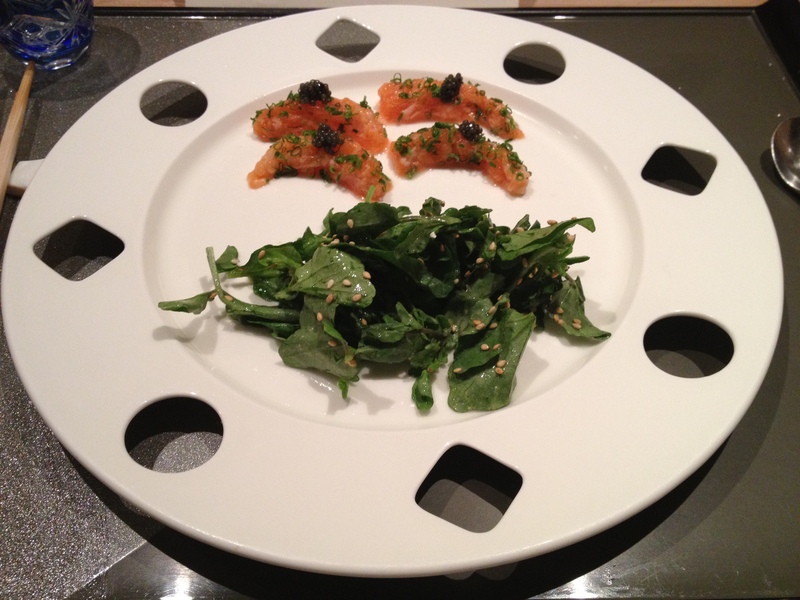 Served on an eye-appealing plate, the Sea trout carpaccio with black truffle sea salt, chive and caviar, on a side with water cress sprinkled with miso mustard sauce and sesame, this dish was both creative and delicious. The tender sea-trout melted gently on my tongue. Enhanced by the even softer texture of the delicate caviar, the crisp and fresh water cress contrasted the mellow nature of the sea world (the fish and caviar). The chef achieved in this dish a lovely balance. Tar tare tuna roll was the special roll of the day so we had to give it a try. It was unique, complex and tasty. The spicy tuna tar tare in a white kelp wrap with asian pear, cucumber, avocado, sesame, pine nuts and scallion was wholesome and perfectly matched a glass of California slightly oaky Chardonnay. I also had the Soto’s miso soup served with tender piece of lobster and uni. It was very nice and rich, but not too powerful. Not the best miso I have had, but satisfying. Drinks: Good sake list and basic wine list with reasonably priced bottles as well as wines-by-the-glass. I liked their California Chardonnay by-the-glass as it was floral and fresh and also the crisp and zingy German Riesling went tremendously well with most of the seafood and fatty-fish based dishes such as the tuna or uni. They also had a bottle of Koshu, the pinkish Japanese wine, so if you feel like trying something different and unusual, go for it! The tea selection is basic – Japanese green tea as usually although it is quite a good one. 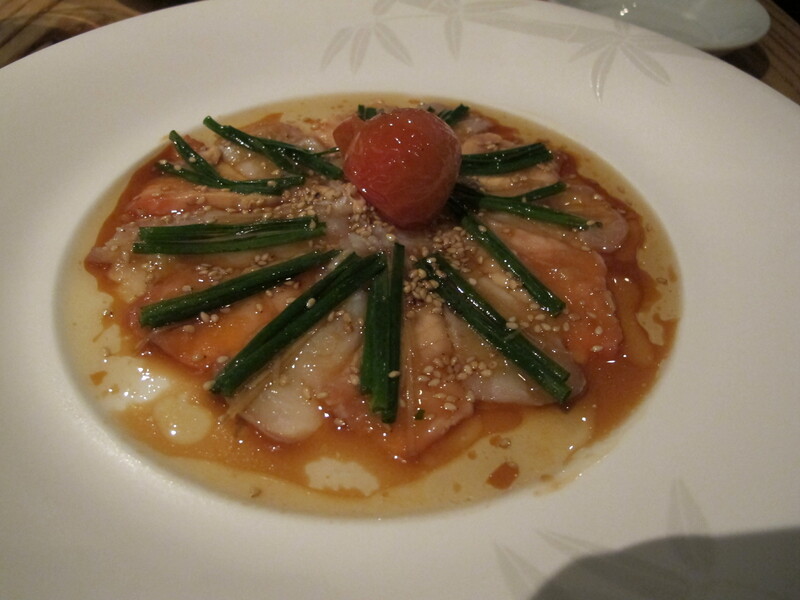 Chef: Nobuyuki Matsuhisa (known as Nobu) is a legend in Japanese cooking worldwide. His partnership with actor Robert De Niro and restaurateur Drew Nieporent bore the famous global network of Nobu restaurants known for the chic atmosphere and innovative cuisine. Matsuhisa was and still is his baby. He and his wife greet the guests and look after the kitchen on most of the nights. Food: Unique&innovative, tasty, crafty and super-famous. There are so many great dishes on the regular menu that I would have to dedicate a page just to name them all. I would elevate the ‘New style sashimi’ such as white fish and salmon on an oily and warming sauce adding the dish richness, easier palatability and fulness, undue in traditional sashimi .’Salmon tartare with caviar’just melts on you palate like the most mellow ice cream. The sashimi tacos are fun, light and crispy. 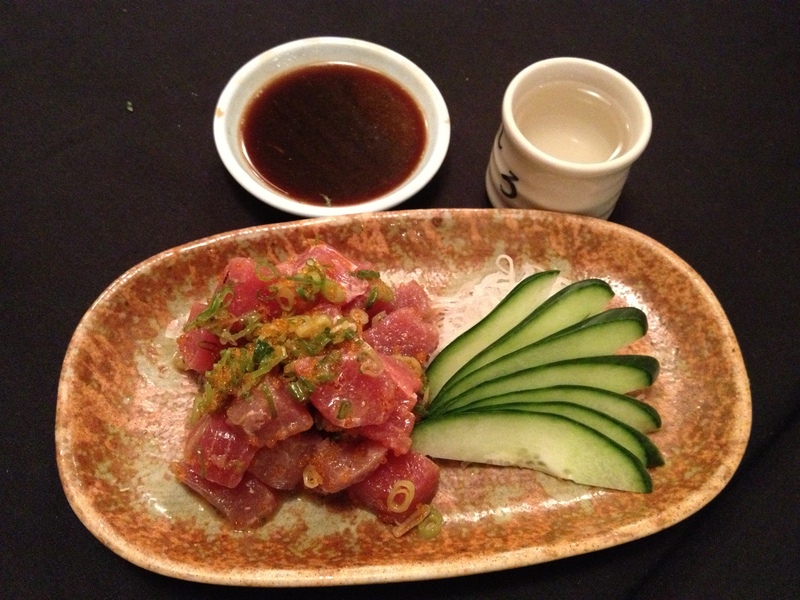 Ceviche (raw fish diced in cubes and served with a lime-based sauce) and tiradito (thinly sliced sashimi-style dish with spicy sauce) come from Nobu’s peruvian era, when he worked as a chef in Lima. His Rock shrimp tempura (fried shrimps with a mayonnaise-based sauce) beats most of his competitors. It is crisp yet juicy and the sauce is so creamy and tasty that one roars for a glass of an intense white wine such as a California Chardonnay with a hint of oak. The ‘King Crab Tempura with Amazu Jalapeno’ again reaches across the boundaries of one country’s cuisine. The Mexican meets japanese in this refreshing snack. I could go forever, but I will cut it short – order Matsuhisa’s special dishes rather than simple sashimi and sushi as these you can get elsewhere. His mastery of mixing ingredients and creating unforgettable combinations will charm the palate of any thoughtful food connoisseur. If you are not concerned about how much do you spend on that occasion and want something different (very Asian), you can also try the ‘Baby Abalone with Light Garlic Sauce’. This for Westerners unusual seafood is so tender and tasty with the garlic sauce, that you might add to the list of your favorite shells. Every day there are special dishes on the white board surfing through the restaurant as the waiters bring it to the inquisitive guests. I highly recommend to go for at least one of these. On the last night we ate there we got the steamy hot ‘Tofu mascarpone’ and that was a hit! I have never had a more tasty warm tofu dish. Combining an Italian staple such as mascarpone with an Asian variation of cheese wich does not have anything in common with cheese except its color is a daring step, but it works! 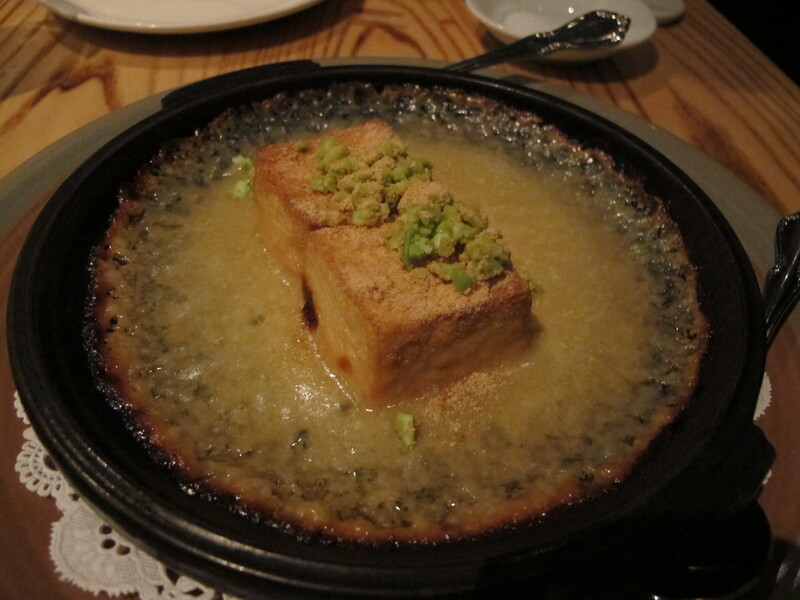 The Tofu mascarpone got such a positive feedback that evening that it might be included in the regular menu. Needless to add – I pray for it. Of course, not every day, all the dishes are perfect, but it is rare to find something at least not good enough. I was disappointed once by their ‘Mushroom Toban-yaki’ or the mushrooms cooked in a sizzling sauce as the mushrooms were not cooked enough so they did not absorb enough of the sauce I mainly love the dish for. If one dish disappoints you then having a dessert will fix all your sorrows. I love the ‘green tea ice cream’ and the japanese ‘mochi’. Mochi is like an ice cream dumpling. 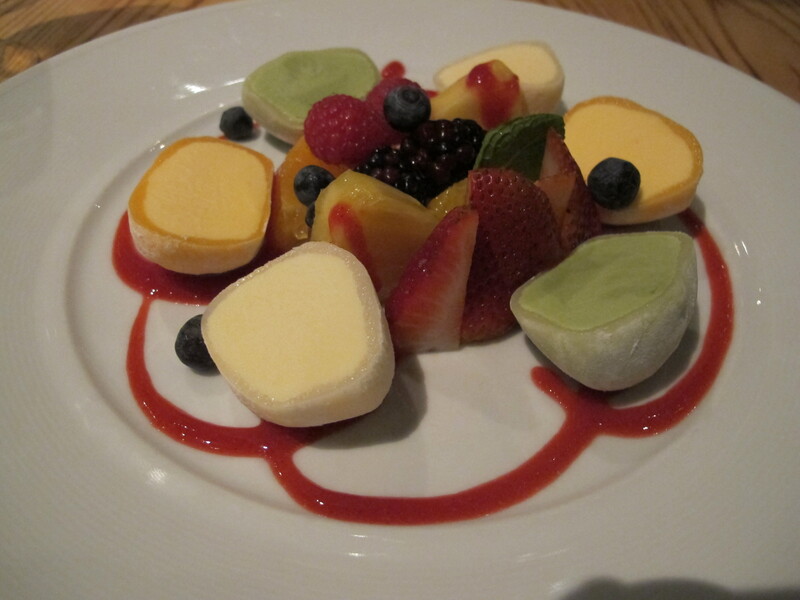 Various kinds of ice cream from mango to green tea are wrapped in a chewy paste with neutral taste so it does not disturb the flavors of the ice cream inside. It is refreshing, delicate and light after a multi-course dinner. A perfect period to end a great dinner. Drinks: Great wine, sake and beer list. They make also cocktails with sake. Nobu’s green tea which is also sold at the premises. From wines we usually order the Californian rich Chardonnay Kistler or Far Niente. The food goes very well with Alsatian Pinot Gris, Riesling or Gewurtztraminer as the sommelier once disclosed in an interview I did with him. The drink which surprised me on the list the most was a glass of milk. It seems that Matsuhisa keeps children and their nutrition in mind as well. Ambience: Casual meets super-rich. The restaurant is very low-key and comfortable. You can wear anything from jeans and snickers to a nice evening party dress as it all blends in Matsuhisa. Forget about the scene, this is all about great food. What is so unique about this restaurant is the loyal service. Most of the waiters I have known for years. They do not leave and switch restaurants as often as it is common in other dining establishments. They are all very friendly and if you are a regular they treat you like their beloved neighbor.